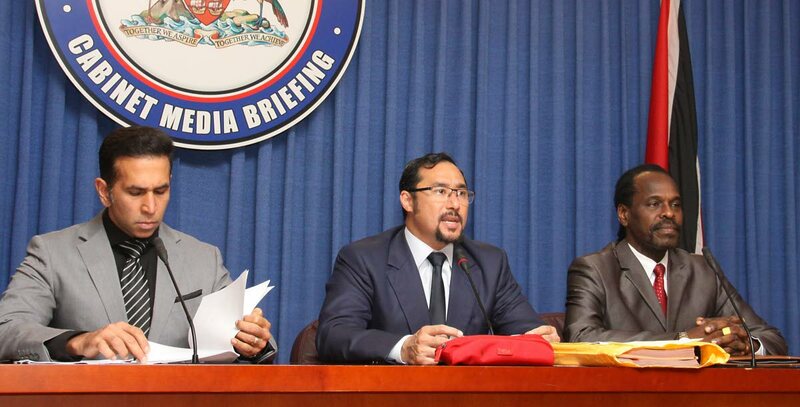 LEGAL BIRDS: National Security Minister Stuart Young, flanked by Attorney General Faris Al-Rawi and Minister in the Ministry of the AG Fitzgerald Hinds, addresses reporters at yesterday’s post-Cabinet media briefing at the Diplomatic Centre, St Ann’s. ANY notion that imported gasoline is inferior to that formerly produced by the Petrotrin refinery was scotched by Minister in the Office of the Prime Minister Stuart Young at yesterday’s post-Cabinet briefing at the Diplomatic Centre, St Ann’s. He debunked recent rumours that gasoline sold at local pumps is an imported and inferior fuel that burns off quickly. Young criticised the rumours as a “distortion of reality” by mischief-makers. Otherwise, Young said the House of Representatives will debate legislation next Wednesday to vest the former Petrotrin’s assets into its successor companies, ahead of Petrotrin’s month-end cessation of operations. Denying the Prime Minister had ever said Petrotrin would be shut, he said only its refinery will close. The refinery will be vested in a new firm, for which proposals can be made by anyone who can make the facility viable. He said the assets of the former firms Trintoc and Trintoplan will be put into the Guaracara Refining Company, while assets of Palo Seco Agricultural Enterprises Ltd will be vested in Heritage Petroleum, the new exploration and production firm. Reply to "Stuart: Imported gas not being used yet"